A study of more than 150,000 UK adults aged 40 years and over has revealed that those who walk, cycle or use public transport for their journey to work tend to be slimmer than commuters who travel by car. The study shows ‘robust, independent associations’ between active commuting and healthier body weight. The results concluded that “active commuting was significantly and independently associated with reduced BMI (body mass index) and percentage body fat for both sexes”. 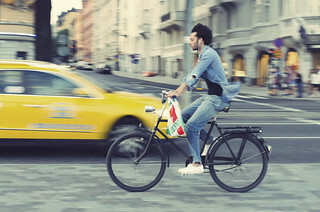 The study identifies cycling as the best means of keeping in shape, followed by walking. The results also show that even using public transport, with the small amounts of exercise involved, has health benefits over using a car. An average height man would weigh around 5kg less if he were to cycle rather than drive to work each day (woman: 4.4kg).